NSS=National Secular Society, which, if you are in the UK, you should probably join. Even if they don’t realise God isn’t a secularist. we want the freedom to impose our religion on others, dammit! In the US, if you go so far as to input “JESUS AND”, your site comes up #1. Not quite as impressive as #3 with simply “JESUS”, but still pretty good placement! I love the strip. Great strip again. And congratulations on climbing the Google ladder to near the top. Didn’t a well-known former senator define “freedom” as “freedom to do god’s will”, i.e. be a right-wing catholic? As a member of the National Secular Society may I say ‘Thanks, Mo’ for the namecheck! @ Chris Hughes,as a fellow NSS member,am I allowed to say “Amen”to that? Okay — this one ain’t a joke, given the number of folks who explicitly say that “liberals don’t have tolerance for our intolerance”. Of course, the problem with liberals is too much tolerance for intolerance. I’m with you Joe, I no longer tolerate religious tolerance. There is no irony in its conflation with racial intolerance. Tolerance provides cover for moderates who provide cover for fundamentalists. Yuck! Stereotyping like this is sloppy thinking and are a strawman attack and mentally removing own reflection at the same time creating false “we/them” or right/wrong in the social environment. I’m conservative when needed, I’m liberal when needed, and progressive when needed. And I know that I do not always have the best answeres. This tendency in the USA (and many other places) to create fronts and black-white, true-false, and at the same time deny the “obvious” thruth while it is “killing” you. Personal bias, the ones that we have a cultural unconscious “beliefe” in, are the hardest to free the mind of. The main difference I se in USA are between those that have too much “cultural induced biases” that defines the basis for truths, and the rest. And this goes over the hol specter, but are more rampant on the right. And the “tea-party” do have THE answere, they dont listen (open up, don not want to, can be infested with false thoughts). Sorry for my english. hope it make some sence and that I didn’t overstep the comment sections policy,. If so delete this, I understand. To cult’s some of which are quite peculiar. Would be nice if not only were people not allowed to impose their religious beliefs on strangers, but not even their own families… including their own children. One of the strangest phrases I ever heard spilled from the lips of a Christian cab driver who was telling me how his rights were being suppressed by people in his community who were selling liquor on Sundays. The Christian majority in his town want to outlaw the practice, but because the city government wouldn’t get on board, my driver and his fellow Christians were being “forced to allow” these store owners to make such sales. It’s all there. The twisted logic of thinking that my freedom is a restriction on your right to tell me what to do. Amazing. I’m just curious to know: what are each of us non-famous folks doing to help further the cause of rationalism, secularism, and critical thinking? This question o’ mine was inspired on the most recent Ask an Atheist ep. Getting irritated and flabbergasted here is not enough– I’d like to know what steps we are taking to make this world/our communities a better (more secular) and safe place. Moi, I’ve written a brochure to leave net to Chick tracts and other religious litter and am working on a blog. Machigai, I’m afraid that our resident poet is a lost cause when it comes to the beautiful language. If you read through a few back editions (any will do, he blesses each one with a – ahem – masterpiece and has done so for a while) you’ll see his punctuation is the least of our torment. Admittedly he has produced the occasional gem, although more by accident than design, but his usual output plays with the rules of grammar as a demolition ball plays with a wall. @Nassar – I love that limerick provided you pronounce “peculiar” so it near-rhymes in three syllables, like peck-yul-yar. 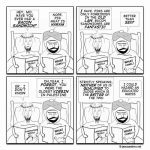 Try this if you really want to be impressed: I typed in “Jesus and Mo” into several search engines and for EVERY SINGLE ONE this strip was #1! I was amazed. I mean, the sheer unlikeliness of this occurring by luck or as a random result! My faith in god was restored, for surely this is evidence of divine intervention? fenchurch, I agree with you and do volunteer work for various atheist organizations when and where I can. I started a blog, but my health will have to improve to follow through with enough good writings. Meanwhile, I tutor high school kids. I don’t proselytize atheism to them, but I do hope to teach them critical reasoning and how to question, so they mature and break free of religion on their own, in their own time, i.e., when they are financially self-supporting. Author, congratulations on Google objectively recognizing your prominence and, for that matter, pre-eminence. I love ya!!! Mo’s been reading Sayeeda Warsi. Yikes, that’s why they call it “poetic licence”, Freedom of Grammar. 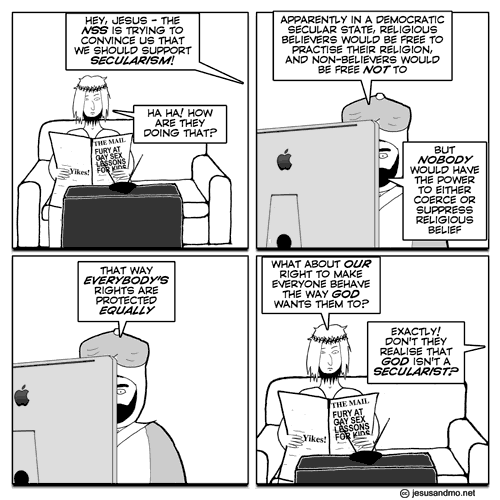 “God isn’t a secularist” – brilliant. That’s one to remember. You just couldn’t make it up! 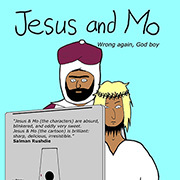 Author: Typing “www.jesusandmo.net” in the box at the top of Firefox took me to last week’s cartoon (21 March). As it had no ‘next’ option, I had to then go back to the previous one before going forward to this! Is it just me? @fuzzy – that’s your browser cache. A hard refresh would have fixed it (hold ‘shift’ and click ‘refresh’). @Authour: Yes, that works. Thanks. I’ve learned somethig new too. Georgina, I’ve got a driving licence which allows me freedom of mobility, but if I were to abuse the laws of the road as Nassar abuses the laws of grammar I’d have my licence revoked. To cults, some of which are quite peculiar. Just a renegade comma with delusions of superiority. Now fixed. Back in the day when NBH was making creationist noises, I invited him to read some books. I suspect he may have actually read a few. Does anybody else detect an improvement in his language and thinking since he first started commenting in our erudite company? He never engages directly, yet he may be revealing himself over time. Shy fellow. It would be deliciously ironic if the pet troll turns into a valued compatriot. Dammit, why do I have to swear not to be be a non-spammer? I could tell them to read (*mumble … my book on the subject … mumble, mumble*) … instead of bloody Warsi, or whatever the hell they’ve been reading. is ‘be be’ a double positive?